McGregor lost to TBE Mayweather, but is his boxing adventure over? 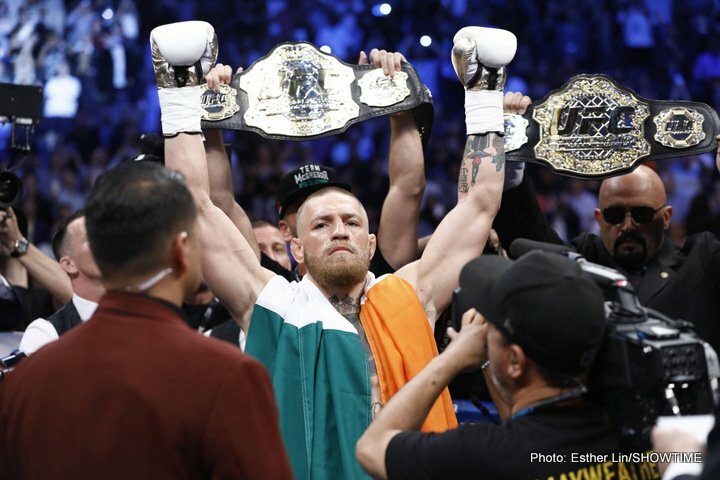 MMA star Conor McGregor lost in his extraordinary debut as a pro boxer, but he was widely expected to do so seeing as he was facing TBE, the now officially retired Floyd Mayweather Junior. But in light of how surprisingly well the Irishman conducted himself on Saturday night, showing genuine boxing skills, his time in the ring may not be over almost as quickly as it began. It’s still too early for McGregor to decide what his next move will be, but as he said himself after succumbing to Mayweather’s fast and accurate fists, he has “plenty of options.” Dana White wants McGregor to go back to MMA, but there remain a number of potentially exciting and lucrative boxing options for the 29 year old. This fight can now be looked at as a 50/50 fight. While Amir Khan has expressed interest in facing McGregor in a boxing match in Ireland. This too would be a big attraction. Who would fans pick to win this one, if it took place at 154? Would Khan’s speed trouble McGregor, or would McGregor’s power trouble Khan’s chin? As hot as McGregor is right now (and he lost nothing in being beaten by Mayweather), millions of fans would likely pay to find out. Bottom line: though some fans may have already tired of crossover fights, they seem here to stay for the foreseeable future. Will any big name boxer agree to face McGregor in the cage, or will “The Notorious” be tempted back into the ring once more? Previous boxing news: Who is Floyd “Money” Mayweather? You are here: Home / Boxing News / McGregor lost to TBE Mayweather, but is his boxing adventure over?